Udoh was sort of a fun hero of advanced stats types a few years ago, during his first stint in the NBA, mostly because on/off and advanced defensive numbers loved him, even though his box statistics and offensive efficiency numbers have always been hilariously poor. In no season in his NBA career has Udoh had a usage rate higher than 14.1 percent; in no season in his NBA career has Udoh had a True Shooting percentage higher than 51.9 (and it’s sunk as low as 44 percent, in 2013-14, with the Bucks). He’s never averaged more than 5.7 points per game in a season, and never more than 4.7 rebounds. He’s just a guy! Except he’s not really just a guy. He was always a fine defensive player, and despite his extreme offensive limitations, his teams have always performed better with him on the floor than off—he doesn’t turn the ball over, he doesn’t take bad shots, and he’s fashioned himself into an ace interior defender. Those characteristics don’t make you a star in the NBA, and the season before he left for Europe (2014-15), his playing time with the Clippers had dwindled all the way down to garbage time, less than four minutes per game. “I’m still one of the best defenders in the world, hands down,” the first-year Jazz forward said. Later in the interview he repeated himself, saying, “Like I said, I’m one of the best defenders in the world — I’ve really developed over the past two years overseas and I really look forward to that challenge over here.” Then he laughed. Here’s the thing about Udoh’s declaration: it may be a bit strong, but there really is some strange magic to what he does in a basketball game. His offense, of course, is a poor as ever: his True Shooting is, once again, a dismal 49 percent; his usage has slipped all the way to a ridiculous 7.8 percent; he’s even snagging fewer rebounds than ever, hauling in fewer than 10 percent of available rebounds while he’s on the floor. But he’s playing regular, meaningful rotation minutes on a Jazz team built around its terrifying defense, and his net rating, at 11.2, is nearly three points higher than the next best (Thabo Sefolosha’s 8.5) on the team. Utah’s net rating—the difference between their points per hundred possessions and their opponent’s points per hundred possessions—slips by nearly 17 points when Udoh is off the floor, by far the biggest dip of any player on their roster. His defensive presence, it should now go without saying, is significant: his defensive rating (96.6) is more than five points better than Utah’s 102.1 team defensive rating (good for 7th in the NBA). Last night, the Jazz went to Orlando and throttled the Magic. I know, I know, the Magic. But the Magic went into last night’s game at 8-7, and with the 12th-best offensive rating in the NBA. 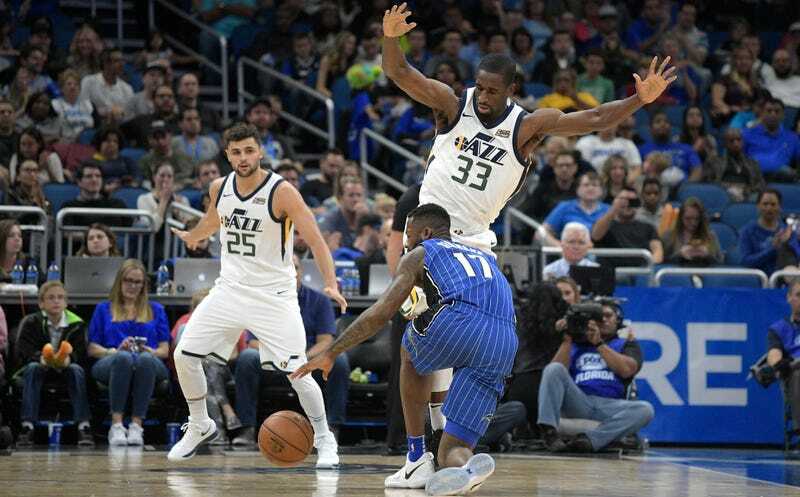 The Jazz held the Magic to 85 points, and did it without the services of center Rudy Gobert, a perennial defensive player of the year contender. There were some ridiculous numbers in this game: Rodney Hood scored 31 points off the bench; Derrick Favors scored 25 points on 12 shots; Mario Hezonja played 15 minutes in a real, live NBA game. Udoh’s box numbers aren’t anything special: he scored four points, and had four rebounds, and committed three fouls, and blocked a couple of shots. But he also finished plus-31, in just 18 minutes of burn. His defensive rating in the game was 67.6! There will never, ever be a highlight reel of Udoh’s 18 minutes in this game, but aren’t you curious? Part of the legend of a player like Udoh is that almost nobody can tell you exactly how he does it, because nothing he does pops, nothing is especially highlight-worthy, and nobody is really watching him. He’s a good rim-protector, and will sit down in a defensive stance and stretch out those wide arms and spend a few seconds at a time bothering the hell out of perimeter players, should the need arise. He defends without reaching or committing a ton of fouls [stares daggers at Ian Mahinmi]. He boxes out [stares daggers at Ian Mahinmi]. He knows where to be, and gets there, and is serious about handling his business once he arrives. The NBA is getting smarter about this. Three years ago, Udoh couldn’t get onto the floor in Los Angeles, and had to go to Europe to ply his trade. Today he’s an important contributor on a good Western Conference team, albeit on a bargain contract. I would trade a finger from my left hand to get Ekpe Udoh onto the Wizards, and Ian Mahinmi onto the Jazz. What&apos;s Gotten Into Grim And Gritty Ricky Rubio?